In 1949 Robert Redvers Lewis Commodore of the Axe Yacht Club carried out an investigation into the adoption of a appropriate two man sailing dinghy. The design would have to be suitable for club one design racing, being capable of both beach launching and suitable for sailing on the tidal Axe estuary. Initial discussions aboard Ray Wilkin’s old Admiralty pinnace Agrad established the basic requirements of twelve feet overall length, clinker construction and a Bermudan rig. The commodore arranged with the Bridgwater Motor Boat Company to demonstrate their Burnham 12 clinker sailing dinghy. It obviously impressed since a member purchased the demo boat and another was ordered. Unfortunately due to the high cost (£125) the class was short lived and upheval in the AYC deterred further orders. 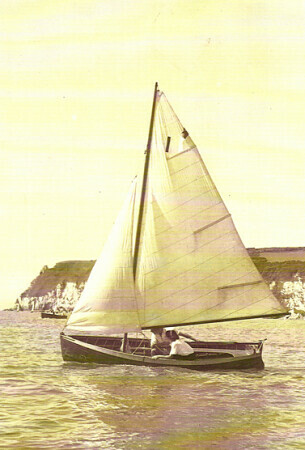 Then in 1951 Vice Commodore Jack Drew took the initiative, using his 12ft 06ins clinker built dinghy named Curlew he proposed using her as basis. The origins of the boat are not clear, however, there are indications that she may have been built by the yacht builders Morgan Giles of Teignmouth. 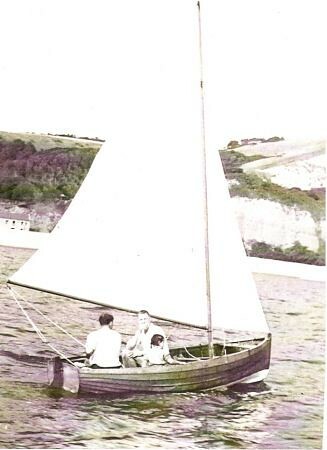 The dinghy proved successful both for racing in Seaton Bay and for river racing, it was from Curlew that the Axe One Design was developed. In April 1951 the A.Y.C. committee meeting minutes record that Jack had formulated a design that was acceptable to the committee and it was to become the club’s class dinghy, upholding the one design concept. The design was slightly smaller than Curlew, having an overall length of 12ft 03ins. The hull form was changed to produce both a finer entry forward and finer run aft, this also resulted in a slightly smaller transom. There had been some thoughts of following the National Twelve in the design of the transom, however it was decided to keep with the more traditional shape, having the garboard plank tucked into the keel at the after end to produce the wine glass shaped transom. In addition the thwart arrangement was changed from three to two. It was through Jack’s efforts that the first batch of boats was produced. His pioneering methods ensured each dinghy was built to the same design and structure. This was achieved by producing a standard set of moulds (five), these were set up inverted, with the boats being initially constructed up side down. 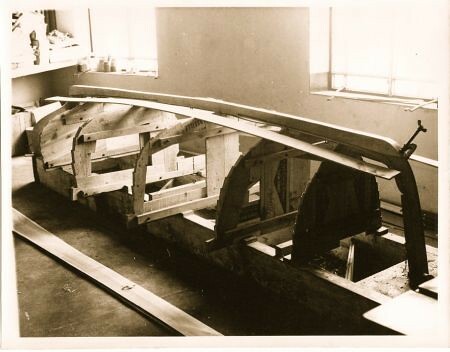 To ensure the hull planking was replicated through out the fleet, a set of plank templates were used. In addition the planks were sawn in half longitudinally so as the planking would match both port and starboard. This produced near identical hulls – even the drilling of rivet holes was replicated throughout.